I think i've missed this spectacle at this intersection earlier in my commutes but recently when I was crossing this place I saw a huge flock of pigeons flying around. In a tiny little triangular land wedged on the end of Malak Ram Issar Marg between the busy traffic square of Pamposh Enclave and Chittaranjan Park also called as C R Park, I saw hundreds of pigeons gathered and flocking around people feeding them. There were 2 or 3 sellers sitting at each corners of this triangular median with grains for people to buy and feed these birds. 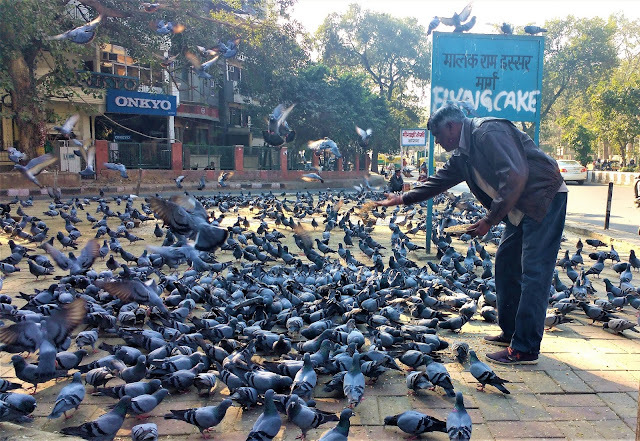 It was delightful to see so many pigeons gathering up and scampering towards the people who were throwing out corns and other grains at them. They looked quite content and peaceful. It was a pleasant sight and nice to see people feeding birds but there are very differing views on bird feeding. Some people do these out of religious sentiments and some for their emotional and spiritual gratification. It is supposed to bring good luck and success according to some religious and astrological views. However, environmentalists and ecologists are of the opinion that this is harmful to the natural eco system and only promotes the birds to lose their natural instinct to prey and survive. The population of pigeons in the city therefore increases to a larger proportion than it ought to be. Since they are fed on only grains day in and day out, they lose on important nutrition from other sources that are very essential for their survival.